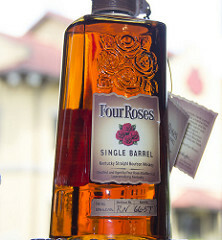 On a recent trip state-side, my friend Rick asked me to pick up a bottle of Four Roses Single Barrel because he’d heard it was good and it wasn’t available in the UK. I decided that if it was good enough that he wanted me to pick one up for him when he came by, it was certainly going to be good enough for me to buy for myself… the logic is sound, right? And at just $43 a bottle at the local store, it was hardly a big bet. This wasn’t my first meeting with Four Roses. I’d tried their Small batch, Single Barrel, and Yellow Bourbon back in May of 2011. Back then, I didn’t have the experience, vocabulary, or the palate to appreciate a 100 proof bourbon. Fast forward five years, a lot of drams, and you bet I can appreciate it now! The label of my Four Roses Single Barrel stated it was from Warehouse No. TS, Barrel No. 41-6E, for what that’s worth, and I suspect there will be small variations between all the single barrels from different barrels. In my mind, they could’ve replaced the Four Roses logo with four cherries, that’s how pronounced that flavor was on both the nose and the palate. Cherry was the high note flavor while plum and vanilla rounded it out. Cinnamon presented itself like the chewing gum Big Red, it was unreal because that was my first thought and it’s been 20+ years since I’ve smelled or chewed that gum, and there was a sweetness ever present. Finish was nice, a little heat and spice, but complemented the cherries, vanilla, and cinnamon. I wonder how much of the fun of this bottle was in the nostalgia of a gum I haven’t chewed in many years. I wasn’t even a big fan of Big Red too, I preferred spearmint gums over different flavored ones. But when I did get a stick of Big Red, the novelty was always fun and it reminded me of all the fun I had in the first few minutes of a Fireball (after the spice was gone, I usually spit those out!). The Macallan is one of the most celebrated distilleries in all of Scotland and one I’ve visited before in the past. It’s a great tradition and most scotch aficionados make it a point to try their signature bottle, the 18yo. In more recent times, Macallan has been leading the way in non-age statement whisky. If you go through any duty free store, you won’t find any Macallan with an age statement. They’re all NAS in travel retail. Regardless of what you think about the general move in that direction (I am not a snob about age but I think something does get lost when nothing has an age statement), you can’t argue that distilleries still have to put out a good product. You may be swayed by the label on the bottle but you won’t be tricked by the dram inside (hopefully!). Macallan’s latest entrant into the NAS whisky market is the Macallan Edition No. 1. 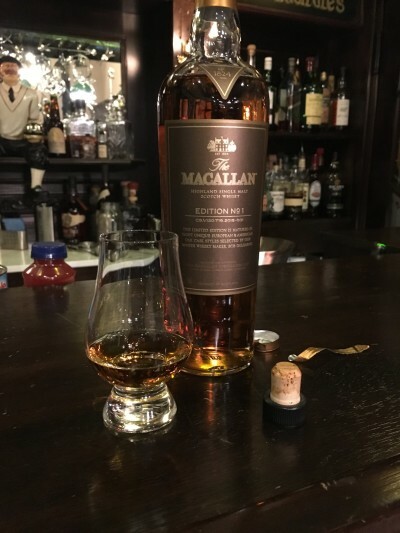 48% ABV and priced at around $100, Macallan says it’s aged in 8 different styles of European and American oak casks, hand picked by Macallan Master Whisky Maker Bob Dalgarno. Nose: Orange peel, vanilla, and a sweetness that reminded me of funnel cakes at the Fair a few days ago. Palate: Full of spice and rich fruit, toffee. Hits with a punch. Finish: Spiced! lingering and smooth. He added – “This stuff is complex and changes with every sip. It’s going to the top of my list…” He has Edition No.2 also, which may make it into a future tasting note on the site (I hope!). Last year, I tried a bottle of scotch that I’d never heard of before — Usquaebach. For us non-native speakers of Gaelic, the word looks like a lot of other scotch whisky names. But it’s a variant of uisge beatha, the Gaelic words meaning “water of life.” The name Usquaebach was commemorated by Robert Burns in a poem, titled Tam O’Shanter (he uses the line “Wi’ usquabae, we’ll face the devil!” – with the water of life, we face the devil!). With that name origin in mind, what is Usquaebach? It’s is a blended scotch whisky and the product is over 225 years old. To prove it, they still sell some of it in an old timey flagon. And for those who are audibly curious, it’s pronounced “oos-ke-bah,” which I probably would’ve gotten on the sixtieth try! Nose: A younger blend with bits of honey, sugar, and citrus. Not much oak on the nose and some spice, like the soft warmth of ginger and some vanilla. It has a little bit of everything except iodine and smokiness but not a lot of anything. Palate: Toasted malt with a sweetness and vanilla. A little pepper spice to it. Light in the mouth, not much heft to it. Finish: Medium with light caramel, chocolatey finish and a bit of pop with the pepper. It was a tasty whisky and they state it has a blend of 10-18 year old whiskies, which I believe. At a price of $43, I wouldn’t rush out and get some (the value proposition isn’t there) but it’s a nice middle of the road (nose/palate-wise) that doesn’t disappoint. Jim Murray releases a Whiskey Bible every year and the 2016 Edition of Jim Murray’s Whiskey Bible named a Canadian whiskey as the world’s best. Not a single Scotch made the top five. 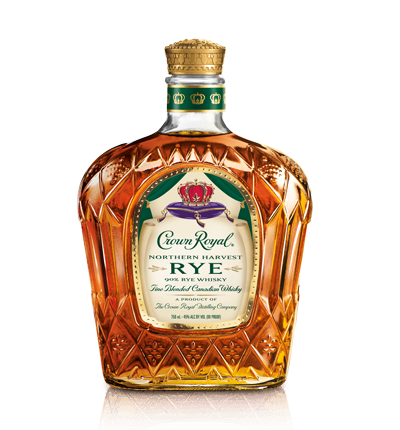 The Crown Royal Northern Harvest Rye scored 97.5 out of a possible 100 points and he called it a masterpiece. I don’t know what I’d call it but when I saw it for $28 at the local store, I picked one up. So what do we know about this before we pop open the bottle? First, a little background on what makes something a Canadian whisky. Canadian whisky tends to be lighter and are blends of multi-grain liquors, most of which will be corn based. Just as in Scotland, it must be aged for at least three years in Canada and be at least 40% in alcohol. Many Canadian whiskies contain rye (albeit sometimes very little) but are not always explicitly labeled as such. The Northern Harvest Rye has a mashbill with 90% rye and clocks in at 90 proof (45% abv). Now that we have the accounting out of the way, what’s it like? Taste: A little sweeter than I expected, not as much spiciness as I expected but has the rye bite I was looking for, cinnamon, molasses, cloves. Finish: Medium finish with a lot of sweetness, bite of rye, and it lingers nicely. OK so here’s where I get tripped up. It tastes very much like the fall, like the scents of the holidays (Christmas!). Now is that because ’tis the season or is it really like that? I’ve tried this on three separate occasions, with different glasses, to see if my original impressions were right. They were. This is like a rye designed to be sold during Christmas. It’s kind of unexpected really. Overall, it’s pretty good. For $28, it represents good value. Personally, I prefer my rye whiskey to have a little more spiciness and bite without the other flavors like molasses, fruit, and cinnamon. It shocked the world when Jim Murray, author of The Whisky Bible, named The Yamazaki Single Malt Sherry Cask 2013 as the best whisky in the world. It was the first time, in the 12 year run of The Whisky Bible, that the first place spot didn’t go to a whisky from Scotland. In fact, Murray didn’t put any Scotches in the top five! Yamazaki is a product of Suntory, which also makes The Hakushu and The Hibiki. Yamazaki and Hakushu are both single malts, Hibiki is their blend and means harmony in Japanese (fitting for a blend). Today, I had the pleasure of sampling Hibiki’s latest no-age statement whisky – Hibiki Japanese Harmony. In Japanese culture, there’s a reverence of craftsmanship. If you have Netflix, watch Jiro Dreams of Sushi, it’s a documentary that chronicles the life of 85yo Jiro Ono, considered one of the world’s greatest sushi chefs. He runs a 10-seat, sushi-only restaurant located in a Tokyo subway station and was awarded a 3-star Michelin Guide rating. That’s astounding, until you watch the painstaking detail and world class craftsmanship involved. Hibiki Japanese Harmony is heralded as the foundation of the Hibiki range, leveraging the same key malt and grain whiskies from the original Hibiki blend, Hibiki 17 Years and Hibiki 21 Years. American White Oak malt whiskies create a solid base. The rare Mizunara (Japanese oak) and sherry cask malt whiskies are the dressing. The smoky malt whiskies enact as subtle accents to create depth and further complexity. Grain whiskies from Suntory’s Chita distillery act as the “dashi,”or broth, to complete the personality of the malt whiskies and enhance their overall harmony. There’s a lot going on in the blend and the fun part is that they tell you. Overall, it’s a light whisky with a lot of fun flavors, heavier emphasis on the floral which is fun because you see that’s what they were going for with Harmony. The aspect I wish I could recognize is the characteristics imparted by the Mizunara (Japanese oak) casks. It’s like knowing there’s a new type of stringed instrument in the orchestra but not being able to hear it because I don’t know what to look for. I’ve had some of Suntory’s other creations and I see this one as a good way to get into Japanese whisky if you’ve never had any. It’s bottled at 43% abv and retails for $68 locally – if I can find one, I’m getting one.